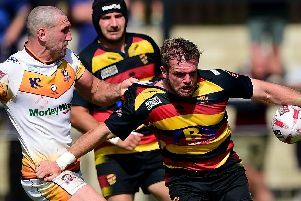 Doncaster Knights boss Clive Griffiths admitted that it was ‘painful viewing’ watching the DVD of club’s 27-14 Championship defeat at Ealing. Griffiths made no secret of his dislike of Ealing’s 3G pitch in the build-up to the game but it wasn’t the playing surface he blamed for the club’s second defeat in five starts. “We knew that it would be tough because they have brought in a lot of experienced players this season and are a much more formidable team,” said the Welshman. “But we thought we’d get over the line instead we contrived to hand it to them on a plate. “The individual errors we thought we had eradicated resurfaced as did the team errors we’ve highlighted and worked hard on in training and no-one grabbed the game by the scruff of the neck. “I feel like a plumber at the moment trying to mend a burst pipe. You think you’ve fixed the problem then another springs up. “Things that we’ve traditionally been strong at we’ve become weak at and we’ve had to revisit and there’s definitely a hangover from last season. “There are periods during games when we are showing what we can do – and we scored two fabulous tries on Saturday. But it’s spasmodic and we’re not playing consistently well and they were good value for their win. To be 27-7 at one stage is gut-wrenching.